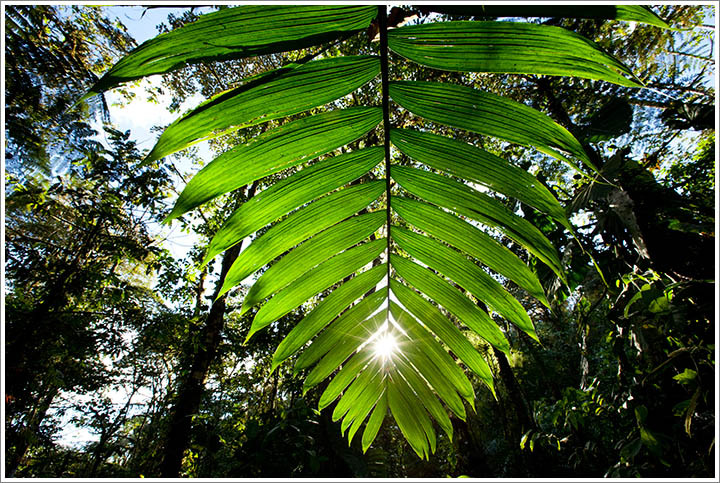 The afternoon sun shines through rainforest leaves in lush vegetation on forest floor in Costa Rica’s Los Angeles Cloud Forest Reserve. “Packing up, I headed out of town for Costa Rica’s famed cloud forests. Monteverde is on everyone’s list, but in the meantime I found a private reserve on the way north into the central highlands. Driving back a winding one-lane farm road, I finally found the entrance gate. Twenty bucks to hike in the reserve, thirty if I wanted a guide. The idea of hiring a wizened forest elder on the cheap didn’t sound unreasonable. I figured he’d help find all of the stuff that I normally blundered past. If nothing else I could get some help carrying my stuff. My guide strolled up wearing jeans, sneakers and a very uncamouflage red t-shirt. And braces. On his teeth. Wizened he was not. It turns out his real job is running the zip line concession, which involves strapping tourists onto a steel cable hung through the forest primevel and sending them plummeting through said wilderness at breakneck, scream-inducing speeds. With the economic downturn, he had the afternoon free. Photographed with a Canon EOS 5D Mark II camera and 16-35mm f/2.8 lens. Exposure 1/30 at f/11. This entry was posted on Wednesday, January 21st, 2009 at 8:18 am. It is filed under On the Road and tagged with Central America, Costa Rica, Landscapes, Rainforest. You can follow any responses to this entry through the RSS 2.0 feed.